The Department of Justice issues a report on vaccine injuries and deaths every quarter to the Advisory Commission on Childhood Vaccines. There are 211 cases for vaccine injuries and deaths for the period 5/16/2015 through 8/15/2015. 86 of the settlements were listed in this report, giving the name of the vaccines, the injury, and the amount of time the case was pending before settlement. Three of those settlements were for deaths linked to vaccines, with two deaths related to the flu shot, and one death for the HPV shot. 65 of the 86 settlements were for injuries and deaths due to the flu shot, and the majority of flu shot injuries were for Guillain-Barré Syndrome. These quarterly reports on vaccine injuries and death settlements from the U.S. vaccine court are seldom, if ever, reported in the mainstream media. We report them here at Health Impact News. 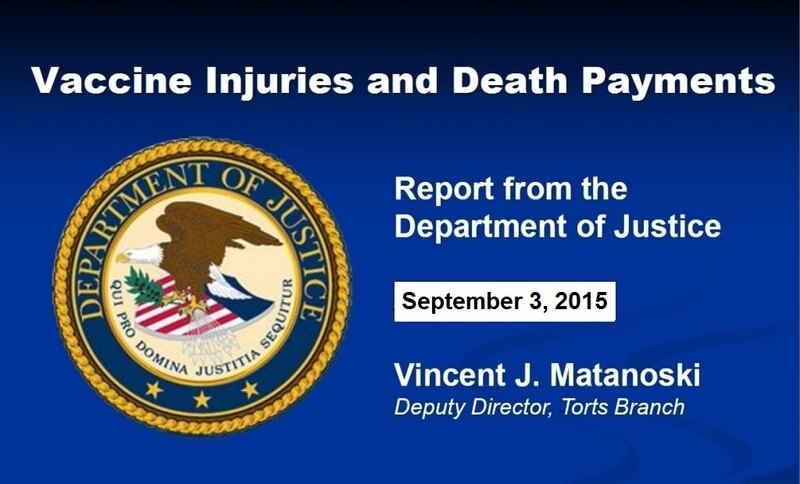 Here is the latest report from September 3, 2015. Thank you for the fine article. It is interesting how the economic impact is not weighed more, especially in the face of conclusions born from statistics. Smallpox is no longer given to anyone being the first vaccine and the only one which eradicated the disease it was protecting against. All the others have fail rates, side effects, even to death along with their benefit for preventing the disease. Obviously ,the less vaccinated the fewer are at risk for ill-effects. As an example, Hepatitis B need only be used in high risk areas, e.g., hospitals and a population more prone to needle use and promiscuity. Unfortunately, the tendency for a physician to exercise individual judgement is rapidly being overridden by a system which encourages a unanimity of action. Vaccines are at the center of this movement as they do not require an individual's assessment. It becomes easier to both justify and enforce. Thus, a medical issue becomes a social imperative.